From the prairies of Big Cypress National Preserve to the rainforests of Madagascar, Naples Zoo and its staff engage in long-term efforts to conserve rare plants and animals. To better connect zoo members and visitors with these projects, the zoo welcomes researchers, directors, and biologists to present their work at the Conservation Lecture Series offered in the evenings during the winter months. Along with seeing a formal presentation in the Safari Canyon theater, guests mingle with these experts and ask questions to better understand the complexities of conservation and how each of us can contribute to making our world a better place for wildlife and people. Giraffe are everywhere in Africa, right? These gentle giants are probably one of the most loved animals around the world and their images are widely used from children’s apparel to marketing a wide range of products. But did you know that giraffe are already extinct in at least seven African countries and that there are less than 100,000 giraffe remaining in all of Africa – this is only a quarter of the African elephant population. In addition, we now believe that there are four different species of giraffe – not just one. Some of these four species were recently listed as Critically Endangered and are facing a silent extinction. Based in Windhoek, Namibia, the Giraffe Conservation Foundation (GCF) GCF is the only NGO in the world that concentrates solely on the conservation and management of giraffe in the wild throughout Africa. But success requires collaborations from throughout the world. GCF works with key conservation partners (governments, NGOs, research institutions, zoos and local communities) in 12 African countries and internationally to make a difference. Their focus is on educating about the plight of giraffe, understanding the different threats they are facing and how to best counteract these and, most importantly, implementing a range of giraffe conservation actions in Africa for their long-term survival. Together we can make a difference, but we have to start act now before it is too late. During this special evening at the Zoo, you'll meet the co-founders of Giraffe Conservation Foundation (GCF) who are leading the global effort to save this charismatic species. Their efforts are chronicled in the BBC/PBS documentary Giraffes: Africa's Gentle Giants. Naples Zoo will offer an informal mixer from 6 to 7 p.m. when you'll learn about how we care for the giraffe at the Zoo as well as hear from Zoo staff who have helped GCF in Africa. Afterwards, the Fennessys will present in the Safari Canyon open-air theater until 8 p.m. Please dress comfortably for this evening outdoors. For the past 15 years, Steph has been involved in a wide range of giraffe projects across Africa and particularly enjoys the fieldwork component. With an MSc in Environmental Engineering and Sustainable Infrastructure, she has successfully worked in diverse working cultures and multi-disciplinary teams within the private, Government and NGO sector on three continents – Africa, Australia and Europe – and her expertise ranges from community based natural resource management to technical sustainability solutions. She is a member and secretary of the IUCN SSC Giraffe & Okapi Specialist Group. As GFC Co-Director and Co-Founder, Steph handles GCF’s day-to-day business using her skills as an experienced project manager with a range of international expertise in the environmental and conservation sectors. 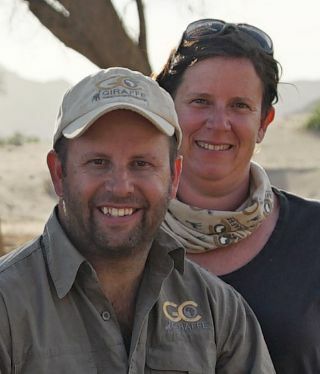 As Co-Founder and Co-Director, Julian coordinates giraffe conservation as the technical expert. He is the Co-Chair of the IUCN SSC Giraffe & Okapi Specialist Group, the Conservation Advisor for the European Association of Zoos and Aquaria Giraffe EEP (European Endangered Species Programme) and has two decades of experience in species and habitat ecology, conservation and land management across the African continent (and Australia) -- with a particular focus on giraffe related activities. His experience in the field of giraffe conservation is something few others can boast, from individual field projects, supervision of students, population and country-wide assessments, to expert advisor on subspecies conservation strategies. Julian has conducted numerous conservation expeditions across all regions of the Africa continent. Julian holds a PhD in Biological Science from the University of Sydney, Australia based on his work in Namibia – the ecology of the desert-dwelling giraffe in Namibia’s northwest. Cost: General Public: $10 | Naples Zoo Members: FREE (Get Free Tickets Online to Reserve Space) | Reserve Your Tickets Here!